Despite technological advancements in the production and distribution of music, the industry has been suffering since the adoption of digital technology, affecting both labels and artists worldwide. But it’s guitar players that are impacted the most. As more guitar content users go online to spend their money — either through direct downloads or streaming subscriptions, traditional platforms are proving an inefficient way for guitar content creators to share and sell their original work due to the low payouts handed out. Guitar players have been forced to turn their attentions online and host their content across multiple platforms in search for revenue, although they face additional challenges of high production and promotion costs. At the same time, they have no control over the terms and conditions for the distribution and sale of their original content — which is, most often, used by the same platforms to increase their own social media following and revenue while giving peanuts to players. BitChord believes that the guitar players’ community dwindling revenue can still be revived thanks to the freedom of decentralization, enabled by sophisticated blockchain technology. BitChord’s guitar content sharing platform and content sales model makes use of the mature technology of the Ethereum blockchain and has already introduced a new feature in the form of the world’s first interconnected marketplace for specialized guitar-related content and equipment on Ethereum. There are several ways blockchain can help the guitar players’ community. With the introduction of blockchain to the music industry, many guitar players — both experienced and novice — could be about to witness a large shift in a positive direction as decentralized technology moves the power away from third parties, and back into their hands. The first blockchain-based guitar content marketplace uses decentralized ledgers to solve many of the key problems that currently exist within the music market. From increasing transparency across the whole industry, and ultimately creating a strong community of guitar players through the promotion and distribution of openly-accessible, moderated, quality content — something, which is often overlooked within this massive sector. The BitChord platform will be based on Ethereum smart contracts, therefore guaranteeing that it is 100% transparent. Eveyrthing will be public information — who sold what, how many times and for how much. Who upvoted who, who tipped who. Who sent BCD tokens to whom, who purchased content from whom, when and at what price. Since the blockchain is a trustless ledger, this will prevent users and content creators from manipulating any aspects of the platform. It’s all going to be out in the open. Fair and trusted. The main barrier that prevents many talented guitar players from creating quality content is the lack of funds. It is the primary reason why so many of them are listing their lessons, backing tracks and other content across multiple platforms and spending a lot of time trying to build up their social media following. BitChord will put an end to this, allowing them to engage with existing audiences and sell their content from a single decentralized platform that lets them keep 100% of their earnings. 1. To prevent malicious attacks on a guitar player’s reputation and rank. 2. To limit the ‘social media component’ that gives too much power in the hands of musically inexperienced users. 3. To allow for the creation of a standardized, transparent and reliable way for rating/ranking guitar content. 4. The upvotes (or “thumbs up”) of established guitar content creators on other players’ work will carry significantly more weight than the average user’s. All content on the BitChord platform will undergo moderation prior to being published with clear guidelines as to what makes it eligible for posting. Once approved, it will not be the subject of user moderation/downvoting. Ever since the rocking 80s, there has been a huge surge in the number of indie and self-taught guitar players battling for a share of the market. More and more are flooding into this competitive music field as we’re writing this. For the majority of them the prospects are grim. They will have to battle each other on YouTube for viewers’ entertainment for little or no money at all while investing time, effort and their own money to develop their skills. If they’re lucky they’ll get “likes” that cost nothing and cannot be exchanged for hard currency. The majority of these players will then be sentenced to remain “guitar hobbyists” or “guitar enthusiasts”, “weekend garage warriors” — that must hold down a regular job to pay the bills. Their guitar playing will be reluctantly accepted by their wives and girlfriends as an “expensive hobby”. Everything that does NOT bring in money — but you keep doing it anyway — yeah, it’s called a hobby. 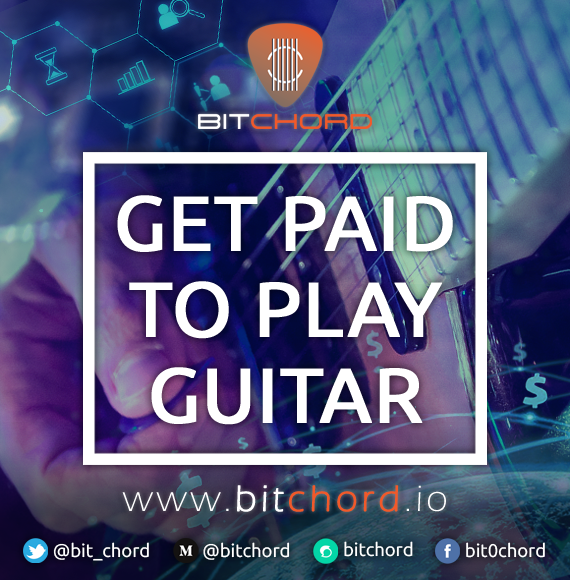 BitChord will level the field by providing a decentralized platform, where they can earn money, learn, share, sell and access premium guitar content. Undoubtedly, moving away from traditional music content sharing platforms towards a decentralized model will take some time, but the rewards are also much larger. For the majority of guitar players, the trade-off is more than worth it. Early adopters of the platform will be able to earn more tokens for their content proving the saying that the early bird does get the worm. With the volatility but also exponential rise in cryptocurrency prices — BitChord makes it potentially possible to earn say 100 BCD tokens for your content, then exchange them a year or two later (when the platform is universally accepted and new players are earning 0.1435 BCD per quality video clip) for the dream house your father told you you’ll never be able to afford as a guitar player. Mortgage-free of course. How about earning 2.5 BCD for moderating and approving quality content as a BitChord administrator/content advisor. Then exchanging it at your favourite online instrument retailer for that custom shop guitar you thought was forever beyond the reach of your budget? The possibilities are endless. Is there a risk? Sure, there’s risk in everything. But the only real risk you have to worry about is getting left behind while other players benefit from participating in the token presale. A decentralized platform like BitChord is definitely something to be excited about — especially for independent guitar players — and everyone can participate in making it a reality at: www.bitchord.io. We could be about to enter a brand new era of music content sharing that finally puts indie players on a level playing field with label giants. The result? Better leverage for guitar players, and higher quality, more engaging content than ever before for their fans. And last, but definitely not least — money in your pocket. Just for playing guitar. You can’t miss out on that. The first blockchain-based platform for guitar players.